Chris Forrester has been called up to a provision Republic of Ireland squad. Peterborough United midfielder Chris Forrester has been included in a provisional Republic of Ireland squad for two friendly matches later this month. Forrester (23) is uncapped, but his form since joining Posh this season has been good enough to attract the attention of Ireland manager Martin O’Neill. Ireland are due to play Switzerland on March 25 and Slovakia on March 29, but O’Neill has selected a provisional 40-man squad which will be reduced before the squad meets on March 20. Ireland are building towards an appearance in the 2016 Euro Finals in France. 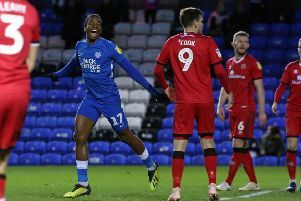 If Forrester makes the final cut he will become the fourth Posh player to become unavailable for the home League One match with Coventry on Good Friday (March 25) because of international call-ups. Three other Posh players have received call-ups, although the club are unable to name them until the relevant FAs reveal their squads. It’s understood Michael Smith (Northern Ireland), Gaby Zakuani (DR Congo) and Kgosi Ntlhe (South Africa Under 23s) are the other Posh players involved. Posh have postponed their League One game at Fleetwood scheduled for Easter Monday (March 28) because of the international call-ups. The Coventry match is being shown live on Sky so Posh would miss out on a broadcasting fee if they postponed that match. Posh chairman Darragh MacAnthony has offered free coach travel to the re-arranged Fleetwood match for those who had already made travel plans for Easter Monday. Contact Chris.Brewer@theposh.com for details.